Blending different fictional universes together is kind of a thing now in gaming. However, Kingdom Hearts was fusing together the Final Fantasy and Disney universes back in 2002. Before chewing director Tetsuya Nomura's ear off about a Final Fantasy VII remake, we got some insight into the still in-development Kingdom Hearts 3. With a PS4 (as well as Xbox One) powering Sora, Goofy and Donald's cartoonish battles, it's already looking damn gorgeous. But aside from grander scale, Disney ride-based attacks and a likely head-spinning storyline, what else can Nomura tell us? And is there a stage where we can hum along to "Let it Go"? The game's been teased for two years, so what's happening now with Kingdom Hearts 3? Tetsuya Nomura: Compared to the initial first look at the game, in the trailer we're showing now, the visual aspects have evolved a lot. Not only the particle effects within the battles, but also the sheer scale of it. While the world may not be comparable to massively open-world titles, it's far bigger than previous Kingdom Hearts titles. There's a huge decrease in load times too. In previous games, you'd run to the end of an area and it would go dark before transitioning to the next stage -- now it's become seamless, as you can see in the trailer when Sora jumps off the mountain you've just battled up. 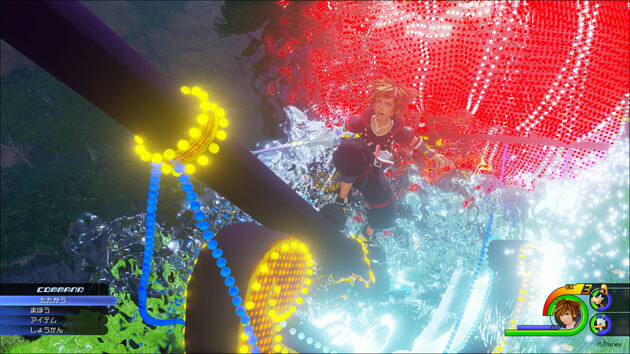 The environments themselves, in KH3, things will be affected by real-time actions, a tornado spell will swirl the blades of grass surrounding it. Given that the game is coming to PS4 and Xbox One, how are you tackling online? TN: Online is certainly part of my wish list -- we want gamers to play for a while and an online component helps this. While we may be focusing on the main campaign at the moment, but it's not as if we're going to tack on an online function at the end. In fact, we've already got plenty of ideas brewing at the moment. However, we're still not at the point where we can test these ideas inside the main game. Why didn't we see many Disney characters in the new game? TN: Well, Donald and Goofy were there -- and we've announced that we're collaborating with Tangled, something we touched upon in our E3 presentation. Compared to previous titles that we folded into Kingdom Hearts, we have a lot of creators still alive. The process of gaining approvals then is pretty different. Because the animation studios are actively involved, we want to polish up anything we meet to the standards we demand, before taking it to Disney to approval. The hair of [Tangled's] Rapunzel is so unique -- we want to make sure we can realize the vision before we show it. TN: We're not saying anything on titles not yet announced. Can we expect far more worlds in Kingdom Hearts 3? TN: With every Kingdom Hearts title, we plan to deliver more worlds than actually appear in game -- so we have something in our pockets to work with. Then as we begin to hone these worlds and stages, and some do get cut. [At this point], we have prepared more worlds, in that respect, than Kingdom Hearts 2. Any worlds that weren't realized in KH2? TN: Man, KH2 was quite a while ago. ... Typically, worlds that we weren't able to put into a game are usually picked up again for work in the sequel. We prepare each stage, planning to include it in a game -- and we love the worlds we come up with. Is anything going to change with how you play the game? TN: Nothing's set in stone, although naturally, the PS4's controller has that touchpanel, and that's something we're going to have to consider within the control scheme. Coming from Kingdom Hearts 2, there won't be a huge difference in battle controls -- we're not going to change how you jump or anything -- it'll be more of an evolution. Depending on how we utilize the touchpanel, we may not need other forms of control [for certain actions]. Control preferences are different from person to person. Especially with cameras. We took an internal survey at Square Enix about this: And the result was an almost precise split, 50:50. TN: Having said that, control preferences are different from person to person. Especially with cameras. We took an internal survey at Square Enix about this: and the result was an almost precise split, 50:50. We're going to have to look into this pretty carefully. Check here for everything happening at E3 2015!